The story of westward expansion in the United States is often told from the perspective of the men and women who crossed the Great Plains in search of a better life in the west. But a historian at Missouri University of Science and Technology is bringing to light the role settlers' animals played in the westward migration of the mid-1800s. Dr. Diana L. Ahmad, an associate professor of history at Missouri S&T, discusses the relationship between pioneers and their stock - mainly oxen, mules, horses and cattle - in an essay published in the summer 2012 issue of Great Plains Quarterly. She notes that the westward travelers' success depended greatly on their interactions with the animals. "Domestic animals successfully brought thousands of emigrants to Utah, California, and Oregon," Ahmad writes in her essay, "'I Fear the Consequences to Our Animals': Emigrants and Their Livestock on the Overland Trails." As a result, "emigrants on overland trails forged new relationships with the domestic animals that accompanied them." Between 1840 and 1860, some 300,000 people emigrated to California, Oregon and Utah. Many were in search of gold, new farmland or religious freedom. The westward travelers learned how to care for their livestock, barter for fresh animals and perform veterinary procedures, Ahmad writes. They also left behind a wealth of written materials Ahmad has mined for insights into how the emigrants interacted with their beasts. 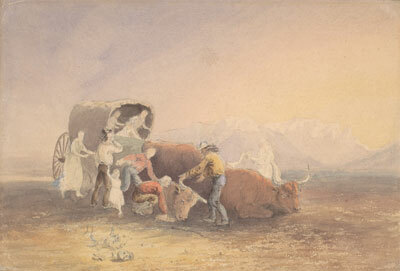 From Diana L. Ahmad's Great Plains Quarterly article: "Wagon in the Desert," courtesy of the University of California-Berkeley, Bancroft Library. Ahmad, who specializes in the history of the American West, reviewed numerous diaries, letters and guidebooks written by these emigrants. "Their writings add to the knowledge not only of the rigors and challenges along the overland trails but also of how the emigrants manifested a new relationship with their livestock," she writes. The authors of these writings "wrote about their experiences ... in a style that was meant to be read by others," Ahmad says. "They understood the significance of their undertaking, that their journey was history making. They also wrote about the livestock that accompanied them, often in great detail and with emotion." Those writings were sent back east and "became valuable tools for future emigrants," Ahmad writes. Excerpts were republished in newspapers and publishers produced guidebooks for future settlers. But prospective settlers viewed information passed along from family members and friends as more credible than the guidebooks or other published materials, Ahmad notes. The significance of animals in history has been largely overlooked until recent years, Ahmad says. Much of the scholarly work over the past 40 years has focused on the role of animals during the British colonial era in North America. Ahmad is one of the few examining the role of animals during the westward expansion of the mid-1800s. She is working on a book on the topic. "Emigrants developed techniques to deal with the creatures because, in most cases, they had no alternative but to learn to work with the situations they encountered," Ahmad writes. "They also developed a companionship with the animals that likely surprised even the emigrants. ... They learned that their success depended in large measure on the treatment of their animal traveling companions."